Product prices and availability are accurate as of 2019-04-20 16:23:33 UTC and are subject to change. Any price and availability information displayed on http://www.amazon.com/ at the time of purchase will apply to the purchase of this product. 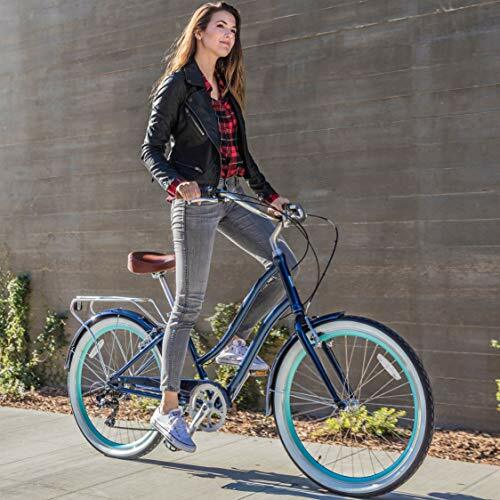 A classic hybrid cruiser made for maximum comfort, the EVRYjourney women's bike has a low center of gravity and foot-forward design that helps keep your back upright while maintaining proper leg extension for optimal pedaling. With looks made for the beach and the gears to take you everywhere else, the sixthreezero EVRYjourney is ready for anything – from hitting the trails at the crack of dawn to cruising the beach at the dusk. 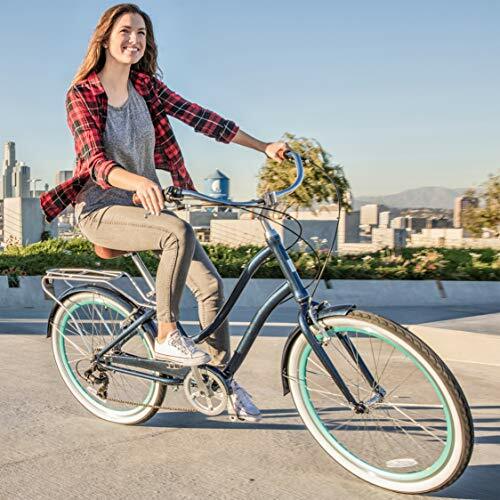 The EVRYjourney's modern swooping aluminum frame is designed with foot-forward seat and pedal positioning, allowing riders of varying heights to stop and put feet flat on the ground. When at a full stop, you can stand over the seat and low swooping frame for easy mounting and dismounting. 21-speed Shimano Tourney derailleur and EZ Fire Plus shifter help you tackle demanding street, trail, long distance, and uphill riding. Front and rear handbrakes make stopping easy and precise. 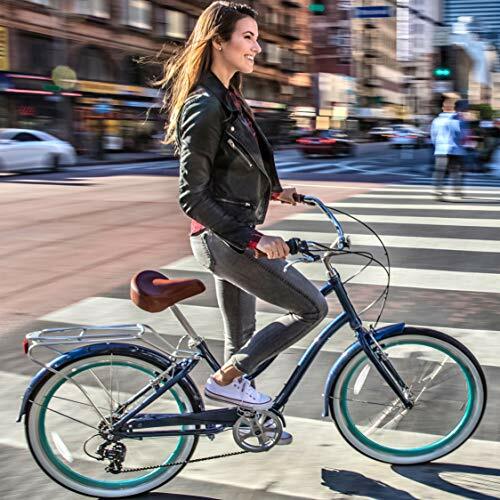 7-speed Shimano external hub allows for a wide range of riding – from leisure to long distance commutes. Includes front and rear handbrakes. 3-speed Shimano internal hub with easy-to-use Nexus shifter enables you to handle longer distances and moderate hills. Includes front handbrake and rear coaster brake. 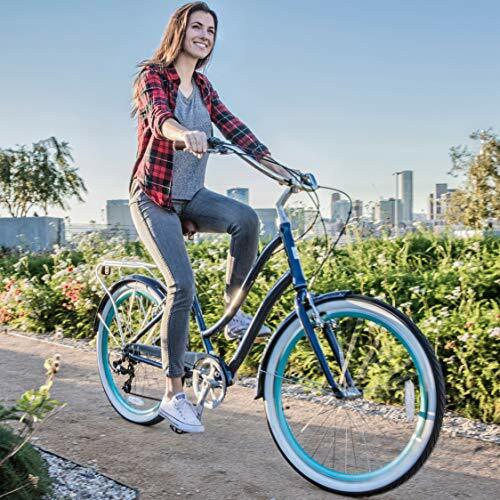 Single-speed model offers ultimate simplicity, and is ideal for flat terrain. The Front Handbrake and Rear Coaster braking system is simple – just pull the left handbrake lever and pedal backwards to glide to a stop. The 1.95-inch wide whitewall semi-slick tires provide a cushioned, stable ride for easy rolling. 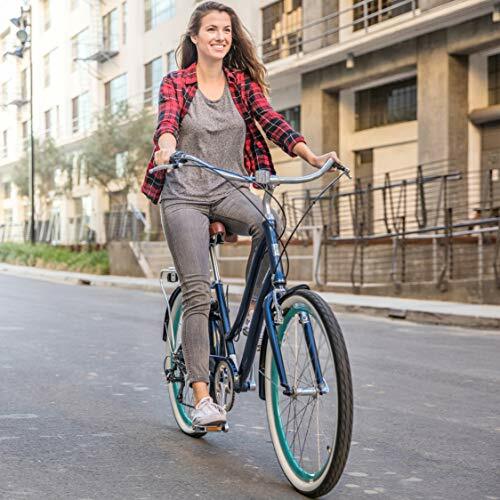 This bike comes complete with a rear rack for use with optional panniers, baskets, and other accessories, plus matching full fenders to keep you protected from rain and debris. It also includes a dual spring seat and leather-stitched grips for optimized comfort. Recommended for single-ride trips up to 30 miles and speeds up to 30 MPH, the 26-inch EVRYjourney is sized for riders from 5 feet to 6 feet, 4 inches tall; the 24-inch model is sized for riders 4 feet, 3 inches to 4 feet 11, inches. It comes 80% assembled, and weighs 38 pounds when fully assembled. 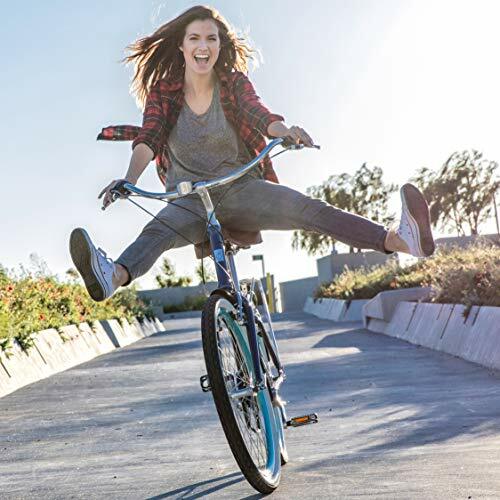 Designed with comfort, ease, and eye-catching style, sixthreezero bikes offer affordable quality for a vast range of riders.